Speaking with a pastor of a Catholic church in the diocese of St. Thomas in the U.S. Virgin Islands are four priests from the Archdiocese of Philadelphia visiting March 19-21, including (from left) Father James Olson, Father Thomas Higgins, Father William Chiriaco and Msgr. Joseph Duncan. 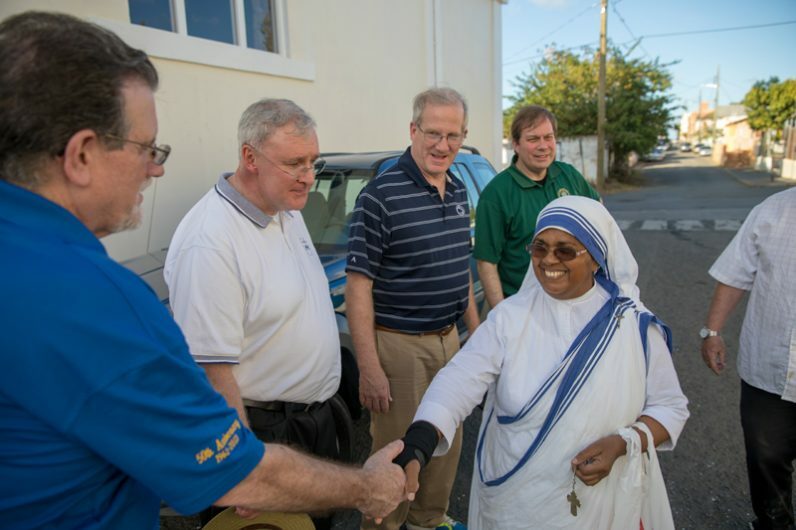 Four priests from the Archdiocese of Philadelphia traveled with members of Catholic Extension on a mission trip to the Diocese of St. Thomas in the U.S. Virgin Islands from March 19-21. The parish pastors included Msgr. Joseph Duncan of St. Albert the Great in Huntingdon Valley; Father William Chiriaco of St. Anselm in Northeast Philadelphia; Father Thomas Higgins of Holy Innocents in Philadelphia; and Father James Olson of Nativity B.V.M. in Philadelphia. Greeting the priests with a Philadelphia connection was Bishop Herbert Bevard, formerly a priest of the Philadelphia Archdiocese who was ordained a bishop and installed as head of the St. Thomas Diocese in 2008. 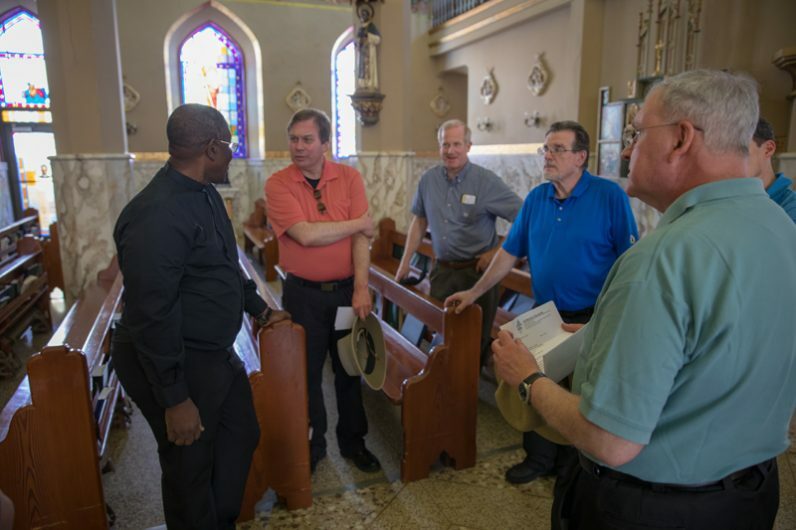 Some of the priests who participated in the mission trip have supported Bishop Bevard’s past appeals in Philadelphia and were eager to see the diocese firsthand. They spoke of imagining an island paradise, but realized there is also desperate poverty everywhere on the islands. One-third of the residents live below the poverty line, and the per capita annual income is significantly lower than that of the poorest of the 50 states. Over three days, the priests visited four parishes and a Catholic high school on St. Thomas and St. Croix, meeting the priests, deacons and religious sisters who work there. They also visited Catholic Charities facilities, a homeless shelter and a soup kitchen. Father Thomas Higgins, pastor of Holy Innocents Parish in Philadelphia, talks with Catholic school students after lunch during a visit to the school in the St. Thomas Diocese. The priests reflected on the deep sense of mission animating those who serve in the diocese, even as they face declining numbers due in large part to the departure of many after Hurricane Maria hit in September 2017. 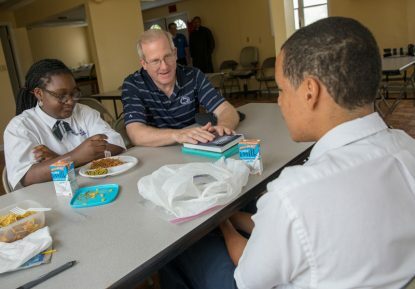 The priests gained perspective on their ministry in the archdiocese and a deeper appreciation for the universal work of the church in a poor area like the Virgin Islands. They took part in a program that invites pastors from urban and suburban dioceses to encounter those in mission dioceses. Founded in 1905, Catholic Extension is the papal society founded to serve mission dioceses in the United States. It has supported the Diocese of St. Thomas since its inception in 1960. Tim Muldoon is the director of mission education at Catholic Extension. Father William Chiriaco greets a Missionary of Charity sister as three other Philadelphia priests visiting the St. Thomas Diocese look on.